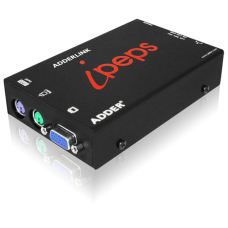 The ADDERLink Digital ipeps product is part of ADDER's 'ipeps' (IP Engine per Server) concept that delivers a complete digital, secure, non-blocking approach to Remote Server management. A powerful and flexible Digital KVM over IP product contained within a palm sized unit, the AdderLink Digital ipeps enables computer access from anywhere in the world, securely and remotely via the Internet or corporate network. The AdderLink Digital ipeps uses Real VNC client software that is specifically designed for secure, high performance KVM over IP applications and supports both IPV4 and IPV6 addresses. The AdderLink Digital ipeps can accept video signals from computers equipped with DVI, DisplayPort DP++ (Dual-Mode) or HDMI along with USB for mouse/keyboard control and for virtual media. The Adderlink Digital ipeps will accept any single link DVI input up to 1920x1200 resolution. It can also be attached to computers with DisplayPort DP++ (DualMode) or HDMI with converter cables enabling access to any computer with a digital video interface. The Digital ipeps gives full control even during boot up, BIOS level or computer crash states, it will even work even if the controlled devices are not operational. The AdderLink Digital ipeps can be accessed by a standard web browser but for superior graphical performance, a Real VNC viewer should be used. Free of the limitations of HTTPS, Real VNC greatly enhances video performance. Employing enterprise grade security (using AES 128 bit encryption and RSA 2048 bit public key authentication) as standard, the AdderLink Digital ipeps is further enhanced by the use of Real VNC that allows for the creation of ciphered user communications. Supports both IPV4 and IPV6 addresses. To transfer files from remote users to controlled computers, the AdderLink Digital ipeps has been engineered to act as a conduit through which data can be passed. Files can be transferred via IP onto the Digital ipeps and onto the target computer by means of a USB virtual media port. The AdderLink Digital ipeps has an RS232 port to allow communication to devices like power switches, allowing remote rebooting of the target computer. The AdderLink Digital ipeps can either be powered from two USB cables or independently from an external 5V power source. 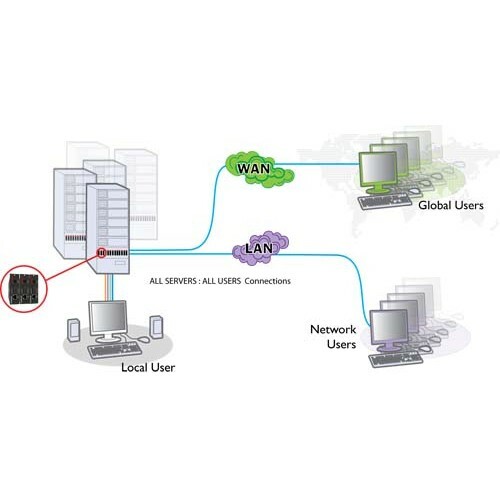 The AdderLink Digital ipeps can create up to 16 user profiles with defined access rights. The unit can be accessed by up to 4 users at any one time. The AdderLink Digital ipeps can be used as a remote gateway into the Adderlink Infinity system by connecting it into an AdderLink Infinity receiver unit. This will allow users to access any computer on the Adderlink Infinity network with their normal username and passwords from any location including mobile devices.